Backed by over 45 years of experience, our Eastridge Workforce Solutions Construction Management division provides customized nationwide search and recruitment services. We are experts in understanding our clients’ specific needs, job intricacies, and providing additional value beyond traditional recruitment practices. Has your organization considered partnering with a recruitment firm to meet your project goals? 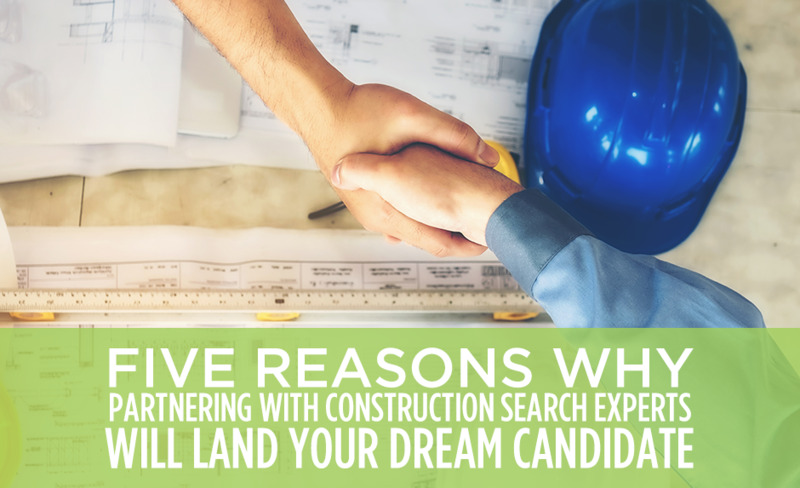 Here are five reasons why partnering with Eastridge Workforce Solutions Construction Management division will land your next dream employee. Every Eastridge client receives a specialized recruitment plan. For every search, our industry experts will work in tandem with you and your organization’s goals to develop a hiring strategy. No matter the position or volume, from executives to project managers, we will secure your ideal candidate. At Eastridge, we have experience searching and placing candidates across the nation’s construction industry. We develop our search strategy based on current trends related to benefits, compensation, talent pool availability, and more. With our specialized reporting, each client is guaranteed to attract the best talent available. We deliver results, and quickly. You will receive candidates for review, on average, within 72-hours and in less than 30-days for niche positions. Our team of experts has a “deep well” of contacts, as our current placements are 80% referral based. Eastridge construction search experts have an average of 10+ years experience recruiting construction professionals, corporate leadership and management. With diverse experience and mastered challenges under our belt, we understand from the start what’s needed to propel your organization. Eastridge Workforce Solutions Construction Management is part of an industry-leading national search firm. We have fostered relationships in all 50 states and understand your area’s talent pool. Our team can connect you with exemplary candidates faster than most firms, no matter your project goals! Our team is ready to assess your organization’s talent needs. Contact us today to see how your organization can benefit from a partnership with Eastridge Workforce Solutions.